Brick Church is a New Jersey Transit station in East Orange, Essex County, New Jersey, United States, along the Morris and Essex Line. Service is available from this station east to Hoboken Terminal, New York Penn Station and west to Dover and Hackettstown. There are two transit lines that service this station which are the Morris & Essex Gladstone and Morris & Essex Morristown. There are 103 trains that come to the station which includes 19 trains during peak hours. During the FY2012, the average weekday board were about 1,610. This stop was ranked #24 out of 148 commuter rail stations. At this location there are available commuter parking and bike racks for passenger use. The brick church itself, originally the Second Presbyterian Church of Orange, can be seen north of the station. The church building dates from 1878, and Brick Church station was probably established not long after judging by the architectural style of the original station building. The present station building was opened in December 1922 when the track grade was raised above street level. Brick Church was the station stop for "the Oranges" made by the Delaware, Lackawanna and Western Railroad's through trains to Buffalo and the west. Its priority continues to this day under NJ Transit, Brick Church having more train service than either Orange or East Orange. The head house has been on the state and federal registers of historic places since 1984, listed as part of the Operating Passenger Railroad Stations Thematic Resource. The station had served several Delaware, Lackawanna and Western Railroad, and then Erie-Lackwanna Railroad, named passenger trains. These included the Lake Cities, Owl/New York Mail, Twilight/Pocono Express and the DLW flagship train, the Phoebe Snow. Birthplace of Samuel Bush. Grandfather of President George HW Bush 41st President of the United States. The station has two low-level platforms serving all three tracks. ^ "D., L. & W. Opens New Elevated Line". The Paterson Evening News. December 18, 1922. p. 1. Retrieved March 5, 2019 – via Newspapers.com. ^ "How Many Riders Use NJ Transit's Hoboken Train Station?". Hoboken Patch. Retrieved 2018-07-18. 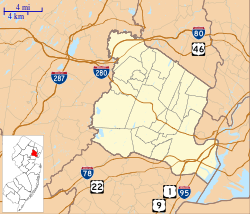 ^ Monmouth County Listings, National Register of Historic Places. Accessed September 2, 2007. Taber, Thomas Townsend; Taber, Thomas Townsend III (1980). The Delaware, Lackawanna & Western Railroad in the Twentieth Century. 1. Muncy, PA: Privately printed. ISBN 0-9603398-2-5. This page was last edited on 6 March 2019, at 06:28 (UTC).